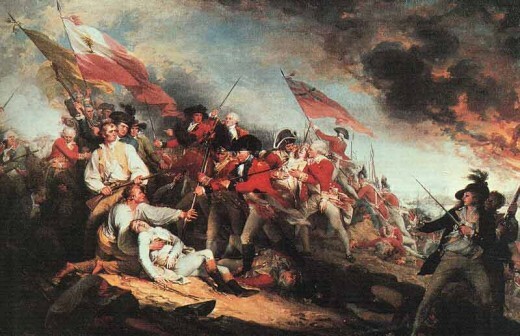 One of the most important Rvolutionary War masterpieces, John Trumbull finished this work in the studio of Benjamin West in London in March, 1786. When in the course of human events, it becomes necessary for the people to dissolve the political bonds which have connected them with their own country, and to choose among the powers of the earth, the sovereign and equal status, to which the Laws of Nature and of Nature’s God entitle them, a decent respect for the opinions of mankind requires that they should declare the causes which impel them to impose their separation from the state. And by John Locke’s Second Treatises on Government, man has the right to overthrow the government of his own country when his government betrays its people’s common good and to start a revolution in order to create a new state, with a new legitimacy to serve its own people. We hold these truths to be self-evident, that all men are created equal, that they are endowed by their Creator or the Source with certain unalienable Rights, which among these are Life, Liberty and the Pursuit of Happiness. That to secure these rights, Governments are instituted among Men, deriving their just powers from the consent of the governed. That whenever any Form of Government becomes destructive of these ends, it is the Right of the People to alter or to abolish it, and to institute new Government, laying its foundation on such principles and organizing its powers in such form, as to them shall seem most likely to affect their Safety and Happiness. But when a long train of abuses and usurpation, pursuing invariably the same Object evinces a design to reduce them under false democracy, it is their right, it is their duty, to throw off such Government, and to provide new Guards for their future security. Such has been the patient sufferance of the mankind; and such is now the necessity which constrains them to alter their former Systems of Government. The history of the present president of the United States is a history of repeated injuries and usurpation, all having in direct object the establishment of an absolute Tyranny over these States and their people. To prove this, let Facts be submitted to a candid world. The Presidents of United States, since the beginning of the Cold war, have committed infinite brutal acts. They used propaganda and suppression to dumb down the American people under the disguise of their fake war against communism, which violated people’s political freedom and freedom of speech. They tolerated the McCarthyism, which was the white terror against the American people. They have fought more than 200 aggressive wars against the world population since the end of WW2 that have devastated numerous countries and killed billions of people. They started at the beginning of this millennium a phoney global war against Islamic terrorism, which is the greatest violation of world peace since the end of the Cold war. In fact they started a war for crude oil, but not for world’s security. They suppressed peaceful demonstrations, such as the anti-war campaign and now the occupy movement. They violated the right of the people to express their own political ideas. They now introduced SOPA to control the Internet. They want to censorship every piece of information and control the freedom of publication as to achieve their heinous goals to enslave humanity. They introduced the Western type of health care system after WW2 not to save peoples’ lives, but to carry out global euthanasia on the growing world population in the End Times. They banned only a few days ago nystatin, which is a safe and highly effective drug to cure many diseases, for which there is no treatment at present. They tolerated the Wall Street’s banksters to satisfy their greed for decades, which caused the collapse of the monetary system in 2008 and the subprime mortgage crisis causing many American citizens to lose their homes. These brutal acts showed that the US government has no legitimacy to exist under the Natural Law. The US presidents have systematically betrayed the national founders’ good will and have practiced false democracy against the American people. The present US government cannot provide the right of life, liberty and pursuit of happiness to its own people. We therefore want to cut off the bonds between government and its own people, to emancipate the people from government’s slavery. We will use any forms of non-violent civil disobedience against the current debased government. We are not afraid of any kind of suppression and imprisonment. This entry was posted in Other Articles and tagged Cold war, crimes of the US government, euthanasia of the world population by the US government, health care system, John Locke's second Treatises, McCarthyism, Natural Law, The Declaration of Independence, the right of life liberty and the Pursuit of Happiness, US phoney war against Islamic terrorism, WW2. Bookmark the permalink.